Have you been watching Scandal? 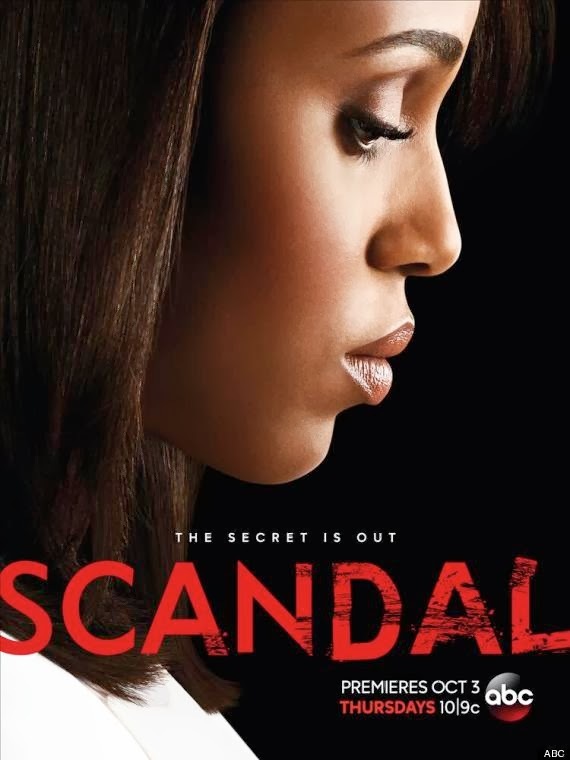 It stars Kerry Washington as Washington DC "fixer" Olivia Pope, and has garnered a pretty devout following over the past two and a half seasons. Last night was the final episode before a mid-season break, and I can pretty well guarantee that thousands of people were on the edge of their seats for the whole show. It's not uncommon now for not only fans to get together to watch in groups, but there are even bars and restaurants that host Scandal viewing parties. Comics, by contrast, have long been seen as a solitary pursuit. After all, part of the nature of reading is that the individual is free to take in the narrative at their own pace. So some people might breeze through a book, focusing on the text and only glancing over the pictures enough to provide context, while others might take their time to notice the subtleties of the artists' craft, catching deliberate nuances in facial expressions or hand gestures. What might be a ten-minute read for one person might be a thirty-minute read for the next. In television and movies, the story is relayed at a rate set by the director(s) so it makes sense that the viewing audience can, and often do, experience the story in pretty much the same way at the same time. I don't watch Scandal regularly, but I've caught a few episodes. The most recent that I've seen (last week's) was in the company of multiple fans. I didn't really care about the show, but I was interested to watch the reaction of an entire group. What struck me was how cohesive the responses were. Unlike shows and movies I've seen before that didn't have an entirely dedicated audience watching together, all of the gasps and "ooo"s and other audible reactions were almost perfectly in sync for the entire episode. If I sit down to watch a movie in the theater, even at the ones with devoted fans, there tends to be a broad swath of reactions at different moments. People laugh in different spots, and a sudden surprise might elicit several different types of verbal reactions. But in Scandal the audience -- at least this one I sat with -- was pretty homogenous when it came to responding to the narrative. Now, here's the interesting bit. The notion of TV being a social media is almost as old as television itself. The whole "chatting around the water cooler" thing, you know? Where people talked about Dallas or The Big GameTM or whatever. And the images of a group of fans gathered around the TV, rooting for their favorite team and laughing and talking and everything is common. But with Scandal, the show itself reigned. There were the gasps and other involuntary vocalizations, but talking during the show was verboten. Not due to some pre-arranged agreement, but it was just understood. And it's not just that one group I was with. Those bars and restaurants I mentioned? They do have pre-arranged rules where talking during the show is forbidden. Commentary during commercials or after the show has ended is fair game, but during the show itself? No. My fiancée regularly spends a good hour or so after each episode unpacking everything about it. Sometimes online, sometimes in person. But always with a group of others who have just watched the same episode. What strikes me about all this is that, while the show can be seen in groups and while the reactions it provokes are similar, the actual viewing of this show is incredibly personal. It doesn't matter who one's with, fans get so into the show that they don't want to miss any of it even if it involves sharing thoughts and feelings about that very show with like-minded individuals. They can save that for later. Which makes watching a show like Scandal an experience more akin to reading a comic book than watching a similarly themed movie in the theater. Taking in the story is, despite the pacing being at the discretion of someone other than the reader her/himself, an intensely personal experience. Even if everyone in the room is sharing that same experience. It would be like you and all your friends reading a copy of the same comic at the same time -- you're all seeing the same story, albeit with slightly different pacing, but the reading experience is very personal. It's only after you all finish that you can socialize your thoughts and feelings about it. And that's what fans of Scandal do. I suspect Scandal isn't the only show with that kind of following. Game of Thrones, maybe Boardwalk Empire. The shows that you don't watch casually. The shows that cultivate the type of fans that light up Twitter and Facebook as new episodes are released. With the ever-increasing fragmentation of media channels, I suspect we'll only see that increase. And I wonder if that fragmentation will lead television (or, rather, its online equivalent) to reflect comic books as far as how its fans are seen and perceived.